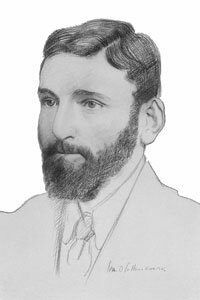 Thomas Kent was born in Kilbarry House, Castlelyons, Co. Cork in 1865. His family had a long tradition of fighting against the injustices suffered by small farmers and fought particularly during the Land War. When Thomas was 19 he emigrated to Boston where he remained for some years working as a church furniture maker until he was forced to return to Cork due to deterioration in his health. Upon his return he spent some months in prison for agitation. It was not unusual for a Kent brother to be in jail and the Royal Irish Constabulary spent much of their time harassing and watching the Kent household. After the split in the Nationalist movement due to the Parnell affair the family seem to have taken a back seat until Thomas joined the Gaelic League and soon afterwards the Irish Volunteers when they were established in 1913. John Redmond, the recruiting sergeant for the British Army and leader of the Home Rule Party was due to give a speech in the village of Dungourney. The Kent brothers invited Terence MacSwiney to speak on an anti-recruitment platform at the same time. The local GAA members and Volunteers marched through Redmond’s meeting holding their hurleys on their shoulders in imitation of rifles. 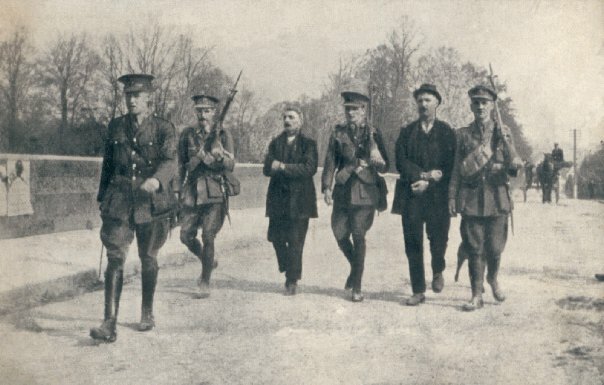 That evening a company of Irish Volunteers was formed in Dungourney much to the consternation of Redmond and the local police. It was only a few weeks after this that the police arrested and remanded Thomas. Despite their best efforts he was acquitted but the police raided Bawnard House a few days after his release and found weapons and ammunition. Thomas Kent was sent to prison again, this time for two months. Later, when news of the Rising in Dublin reached the Kent brothers they waited in some neighbouring houses for orders to mobilize. These orders never came mainly thanks to MacNeill’s countermanding order and to the fact that J.J. O’Connell came to Cork with the order to stand down. By the 2nd of May, four of the brothers, Thomas, William, Richard and David returned to Bawnard House. At dawn, the police came to the house with orders to arrest the whole family. They had surrounded the house and called for the four brothers to come outside. Thomas replied that they were soldiers of the Irish Republic and that there would be no surrender. To this the police retorted with a volley of shots. For the next three hours a battle ensued but the Kent’s, with only three shotguns and one rifle to their name, eventually ran out of ammunition. Mrs. Kent was in the house throughout the battle and not only gave great encouragement to her sons but helped to clean and cool their weapons. The outcome of the fight was that one of the brothers David was wounded and a Head-Constable was killed. In the confusion of the Kent’s surrender, the athletic Richard who had suffered some mental health problems in his past, made a dash for the woods rather than return to prison. He was mown down and killed in a fusillade of RIC rifle fire. The constables were enraged and threw the two remaining brothers who could stand up, against a wall, and were going to shoot them but for the intervention of a military officer. On the 4th of May, William and Thomas were court-marshalled. William was acquitted but Thomas was convicted and sentenced to death for taking “part in an armed rebellion…for the purpose of assisting the enemy.” Thomas Kent was executed by the British in Cork Detention Barracks on the 9th of May 1916. 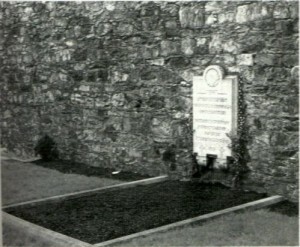 Grave of Thomas Kent Victoria Barracks, Cork, which is now Cork Prison.